Join our group of energetic men, women and teens who serve the Cleveland Clinic Indian River Hospital and the Treasure Coast community. Share your smiles, skills, compassion and time with patients, visitors and the hospital family while making new friends. The Auxiliary has been a forceful presence since 1952. The hospital appreciates the commitment of the volunteers—a strong, community-spirited group who come from all walks of life and occupations. Their dedication is matched only by their flexibility to change as the hospital continues to grow to meet the medical needs of our community. Comprised of more than 500 dedicated volunteers, the Auxiliary includes people from all walks of life including many who are previous healthcare professionals. Auxilians contribute nearly 100,000 hours of valuable service each year and raise money to assist the hospital in its growth – over $4 million to date. 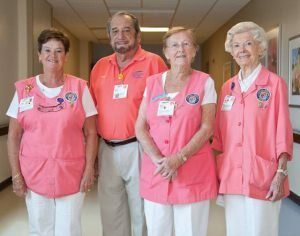 In addition to serving others as they work within the walls of the hospital, volunteers act as public relations advocates for the hospital among their neighbors and friends. They take great pride knowing they are providing meaningful services that improve the lives of others.